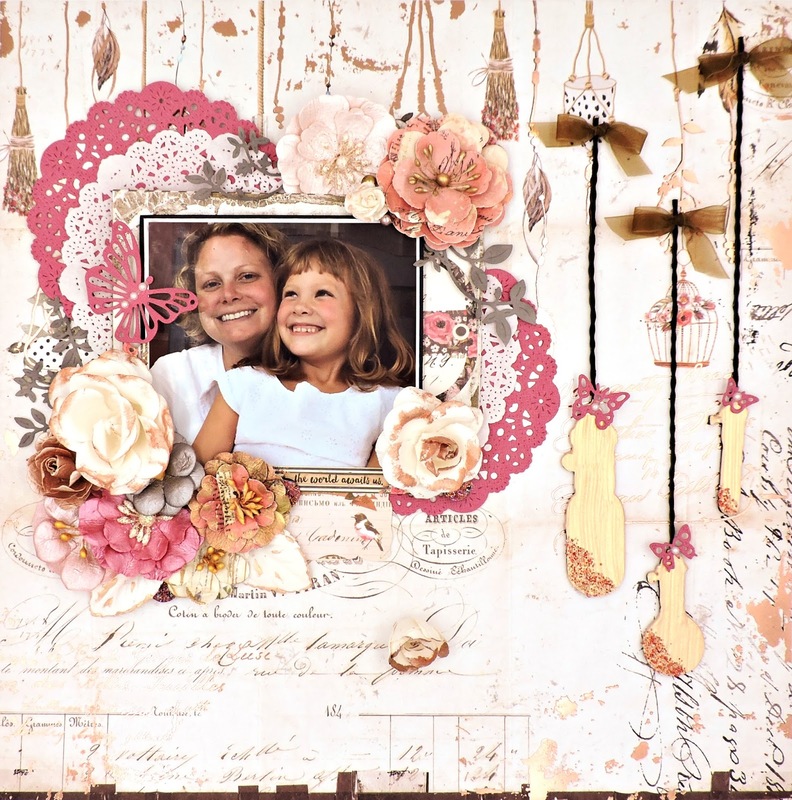 This mother/daughter photo and the gorgeous Rossibelle collection by Prima are a perfect fit for this month's Swirlydoos All That Flutters Challenge. 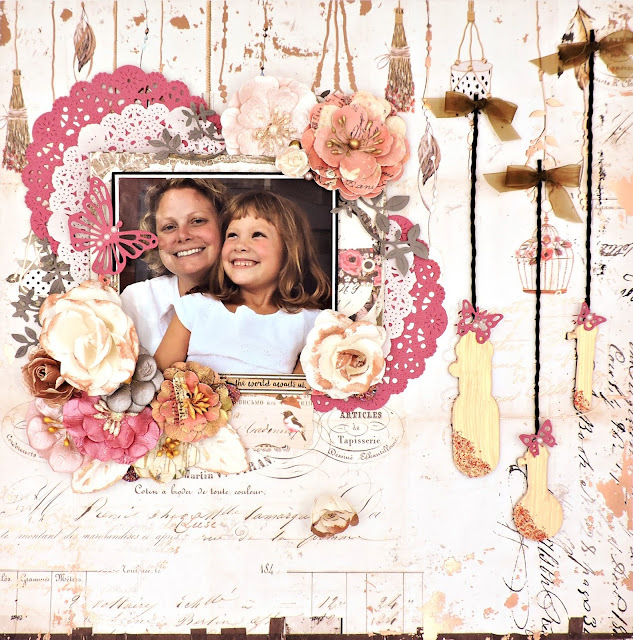 For the most part, this page was made with the Rose Garden kit from Swirlydoos; I've added a few pieces that I've had for a while. I'm usually not so heavy with details and embellishments, especially when using such a busy piece of pattern paper as Nostalgia for my base, but somehow I just couldn't help myself and in the end, I must admit that I like the results. The Dusty Attic Hanging Bulbs chipboard pieces that came in the main kit were primed with black gesso. I painted the bottoms with Prima's Opal Magic acrylic paint in Rose Gold and sprinkled some Micro Beads in Blush on the bottoms. After adhering them to my page, I added some tiny bows fashioned out of the sheer ribbon trim that were also in the main package. I matted the photo with a bit of black cardstock, then on a scrap from a previous layout and placed it on a couple of Melissa Frances' Paper Lace doilies and two more that were cut from Core'dinations cardstock in Sassy with Cheery Lynn's French Pastry die. When that was all done, I tucked in a few pieces of Rossibelle ephemera here and there and placed a sticker from the package on the bottom of the photo for my title. Next, I had fun with flowers - some from the Flower Add-On and others from my stash that blended in perfectly. I added some Druzy Stones and a few Cottage Cutz Leafy Vines left from my Calle D Chartres layout to my clusters. Last are the flutterbies - cut from the same Sassy Core'dinations cardstock with two of my dies - Mini Butterflies by Cheery Lynn and Flutter of Butterflies Lace by Die-Namics - with bits of Kaisercraft pearls in the centers.